We interrupt this fiber adventure to show what Spring – yes Spring – is like in Upstate New York. Yes, that’s snow – a lot of snow. 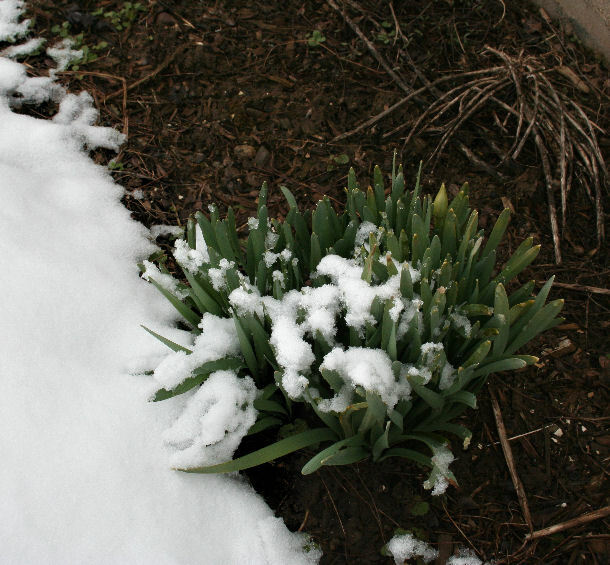 Yes, it’s Spring – but I live in Upstate New York. That first picture is one of an English Walnut tree planted beside our driveway. It is a beautifully regal tree with nice even branching. It is home to lots of birds in the summer, and has a bed of crocus and perennials sheltered at the tree base. You’d never know, as they haven’t dared start their journey to the surface. This picture is of 3 of the evergreens edging our driveway. 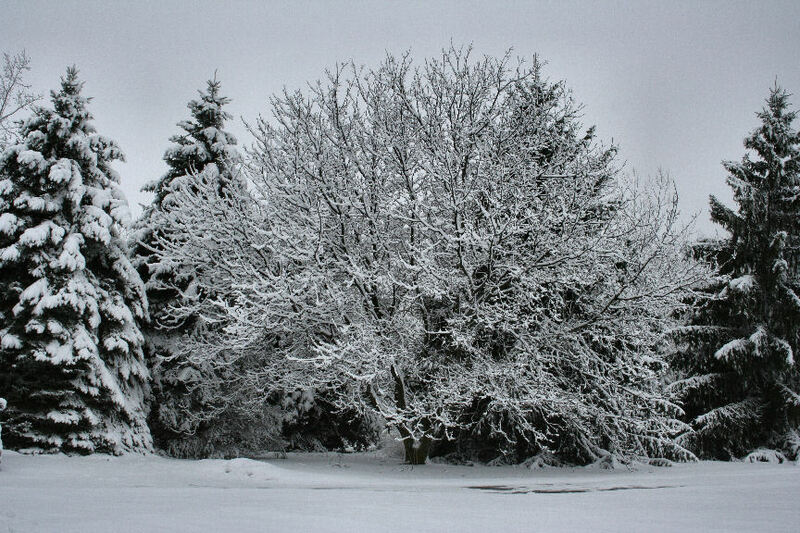 They were planted to keep the snow from drifting in and filling our 550′ driveway, and they do a wonderful job. You can see a bit of the English Walnut tree on the left of the picture. 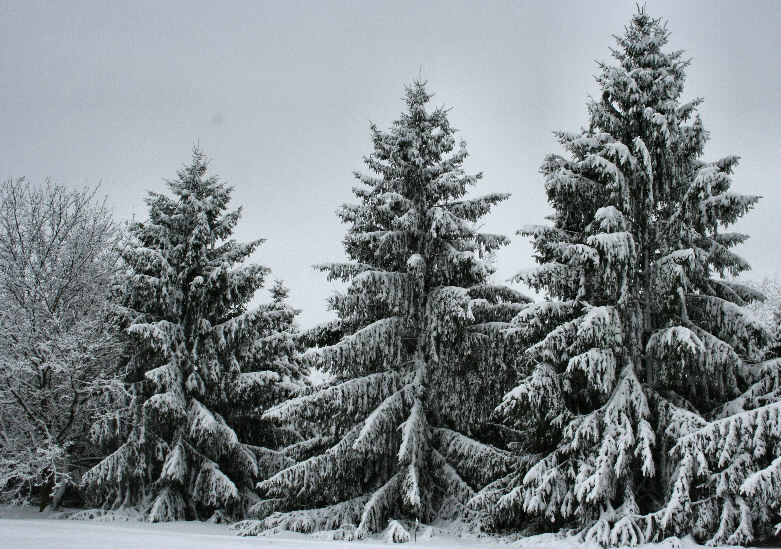 Now you can tell just how tall these evergreens have grown. I do remain ever hopeful though. This last picture is of some daffodils, bravely pushing their way to the sun. They are planted along the foundation of our house in the backyard. The backyard has a southern exposure and the first signs of Spring make their debut along the house. I’d deeply appreciate it, if anybody from the south is reading this blog, to please put some fans on, and point them towards the north. We could do with some nice southerly breezes up here. Last night I worked on the hamster cell project started in Rosalie Dace’s 2005 workshop. It felt so good to start sewing the background. Hopefully it will be finished before the end of the month and I’ll post a picture. It’s nothing like what Rosalie makes, which is good. Have you ever taken a workshop, and everyone walks out with pieces that look the same? That’s great for a pattern class, but not so great for a fiber art class. This afternoon is the first meeting of a small fiber art group I’m starting on my side of the city. Most meetings are on the other side of town, start early in the morning – I am not a morning person – have room fees, and while I dearly loved all the people, it was too much for me. One of the ladies is a terrific tatter, and guess who will be getting a lesson? I’m bound and determined to make that floral motif properly. We’ll also have time for Show and Tell, and critique each other’s work – if critique is desired. 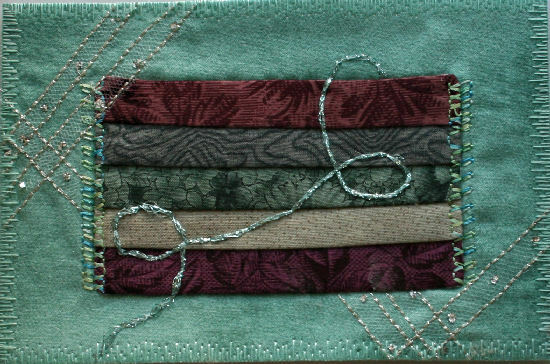 Personally, I find this a very importatnt part of a fiber art group. Constructive critiques help tremendously. Sometimes I’m too closely involved with a piece to see how it really appears. Another set – or 2 or 3 – of eyes is so helpful. I hope each and every one of you have a wonderful day today. The March TIFC fabric postcards are completed. This last one – the dark value one – against the moire fabric is quite elegant – in my eyes. Antique style Mill Hill beads were hand embroidered using my hand dyed 60/2 100% silk yarn in the feather stitch pattern. 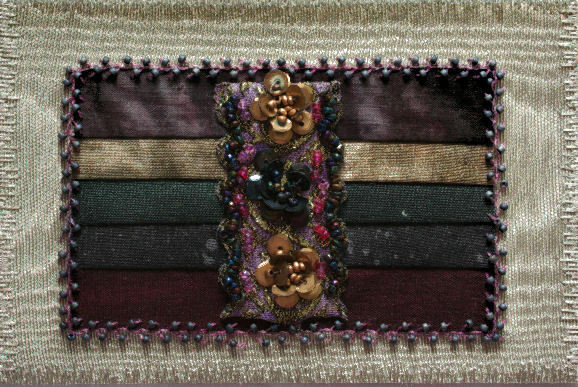 The center trim came from India and I realized when you cut a beaded trim, be prepared for a cascade of beads. Next time I’ll sew threw the last few beads close to where I will make the cut. No more getting on my hands and knees searching for little beads in the carpet. Coco – my Himalyan blue-eyed feline beauty – got interested in the project as she heard the beads bouncing from my cutting table on their way to the carpet below. I could have done with a little less assistance. The 3 postcards were supposed to complete my March TIFC challenge. Making the value color chart, selecting fabrics to match, then making the 3 postcards in colors I seldom use was a stretch for me. Some surprising secondary color combinations were discovered and it was very good to learn how to create different compositions. But I couldn’t stop there. The postcards use all 5 colors together in light, medium and dark values. Blending each individual color from light, medium to dark was also an option. Soooo, when I sewed the fabric strips at the beginning of the challenge, I made 2 different groups. One for the postcards and one for a black and white contrast sample. Color perception varies with what is next to it. We know that, we’ve read about it in books, learned it in color theory workshops; but I wanted to make a sample and keep it hanging in my quilting room, so that I could see it in fabric. I love it. Each of the 5 colors in the TIFC is represented in 3 color values. All thelittle strips are the same size. All the black and white fabric pieces are the same size. All the same colors are across from each other in the strip. It sure doesn’t look like everything is equal, does it? Oh, I love it. I just love it. This tactile representation of a scientific theory is just what I needed to make. And yes, now I really am done with the March TIFC. The graph, the postcards, and the black/white contrast piece – WOW 3 for the month of March. What can I say? I was thrilled to be added to the group, and got a wee bit enthused about it this month. Now it’s time to get back to my regularly scheduled activities. That tatting motif I tried to make last week has resurfaced in a second edition and I decided to crochet a variation of it to see how the two compared. The tatted motif – on the left – was made with YLI’s Jean thread and the same beads. It came out much better than my first attempt, and it took a little under an hour to complete. The crocheted motif – on the right – is more delicate looking to me and it took about 10 minutes to make. Both designs are about the size of a dime. Which one do I like better? Originally, I thought why ever bother tatting? It’s much quicker to crochet a motif and it came out really pretty. Then a dear friend – Lona – pointed out that yes, they were similar, but they were different. There would be opportunities to use both motifs depending on the project. Am I ever lucky to have her as a friend or what? She was spot on with that advice, and I couldn’t see it because I was focusing on the amount of time it took to make each motif. The second (medium) color value fabric postcard in the TIFC was completed last night. This one has clean simple lines. I was sorely tempted to add lots of flowers and leaves at the top of the metallic Candlelight swirl, but kind of liked the straight forward lines on this card. The fabric strips were fused to the background in the first challenge. This time I sewed some light weight interfacing to the right side and turned the strips to get a nice clean edge. I then appliqued the section in place with a decorative stitch from my sewing machine along the sides using a PolyNeon Madeira thread. Some decorative tulle I saved from something or other was next. I fused some Wonder Under to it and it’s a very good idea to use a teflon sheet for this. It’s messy as the fusible comes through the tulle, but I loved the little silver metallic dots on this tulle. The overlapping design didn’t show well, so I edge stitched the strip sides with YLI’s Fine Silver Metallic thread. The last step was drizzling some YLI’s Metallic Candlelight thread over the piece, and I do mean drizzle. My first attempts to make a planned scroll or loops looked forced. Then I just dropped the thread on the piece and let the thread do what it wanted. Darned if I didn’t like the loops and draping better than anything I’d been trying to create. It was hand couched in place, and as long as I had a threaded needle in hand, I hand appliqued the long fabric strip edges. There is something quite soothing about hand work and while I love my sewing machine, use it a lot, and would not want to be without it, I am going to strive to have all my future projects have some hand work incorporated in it. To me, hand work is like the final touch before you send a child off on the school bus for the first time, or get on a plane and hug your loved ones good bye as you start a new journey. It’s not a farewell. It’s a “be safe, enjoy your time out in the world, I’ll be here when you get back” sort of blessing. I can’t wait to mail these fabric postcards – spreading the spirit of creativity through the post office, one fabric postcard at a time. Yesterday was spent trying to make a tatted motif. All I can say is I need a lot more practice trying to shuttle tat. Even with watching the wonderful videos on Sharon’s – from Ontario, Canada – tatted lace site http://www.gagechek.com/slb/ it took me awhile to get the hang of it. For some reason needle tatting came easily to me, but shuttle tatting is a totally different approach for me, and the results were not pretty. Part of the reason was the thread. Metallic slubby thread is not a good choice for a first attempt. And as long as I was making the entire process more difficult, I threw in using beads for the first time too. Not to be out-done, the pattern selected was written for experienced tatters – no detailed instructions. This was destined for failure. No, it doesn’t look picture perfect, and that’s why I put this photo on my blog. Not everything comes out the way I want the first time around, and that’s okay. It takes time and practice to develop new skills and shuttle tatting is a new skill set for me to develop. Another reason for uploading the photo is to share how I’m going to use this little motif. I’m going to hide the start and end – where the motif spreads out – with some embroidery. When it’s used in a project, nobody will know that it is a wee bit cockeyed. Well, nobody will know if you all don’t tell on me. Shhhhhh, this is between us textile artists. This motif was supposed to be used for the second fabric postcard in the TIFC, but it is not right for that card. Who knows where it will be used? For now, it will take a place in the drawer holding all my little bits of lace, sewing machine free standing lace motifs, and other small textile treasures, waiting for it’s turn to shine. The first piece in March’s TIFC has been completed. There will be a total of 4 pieces: 3 postcards (light, medium and dark values) and one combination piece probably journal page size. The light value postcard was finished last night. The center is the fabric selected from the color blending chart I made last week. That chart was a valuable reference tool for me. The center fabric was fused to the background violet silk fabric and sewn down with a pretty built-in decorative stitch on my sewing machine with Madeira rayon thread. The scroll was sketched onto a piece of water soluble stabilizer and then sewn with YLI’s Jean Stitch thread. I selected a variegated pastel and sewed twice around the scroll. The lace flower on the bottom corner is from a fabric remnant of a dress I made for myself when my niece was married about 12-13 years ago. 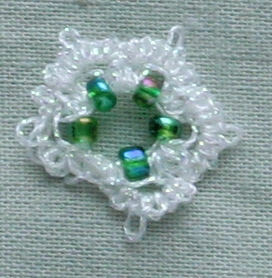 I appliqued it in place with matching Madeira rayon thread, then hand sewed the glass donut bead in the center. The upper left corner has a metal wire scroll I made on a jig I purchased a couple ofyears ago. There is a fabulous site www.wigjig.com that has many wonderful designs available. The pattern I selected was # 20 from the Twenty Pair of Earring Jackets section. The wire scroll was also couched with invisible thread. I wanted to make sure a loop would not pop up going through the automated mail sorters at the Post Office. Adding the little yellow stamens to the white flower was the last step. It really needed something. A big white flower with a glass bead in the middle was too stark. I couldn’t believe the difference those tiny little yellow leaves made. Directions for those are on Melissa’s blog also. Madeira rayon and a different stitch around the outer edges joined the top, center cardstock, and muslin back together. Voila, my first of three postcards in the TIFC is completed. 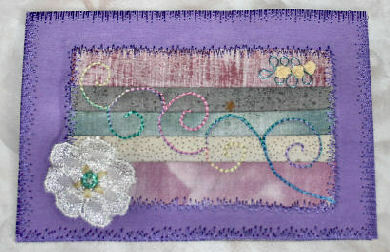 I did not do a lot of embellishment on this piece because the goal was to maintain the light value of the center fabric. The fabric had to be visible and not altered too much by the embellishments. When it is placed next to the medium and dark value postcards, I would like the color blending to be a smooth transition. Hopefully, I’ll be able to achieve that goal. 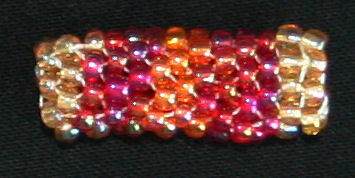 Last night I attempted to make my first peyote stitch bead. While it’s not perfect, I enjoyed making it and love the warm, bright colored beads chosen. This first bead was left open on each end – it’s a tube – so that I can thread yarn, other stringed beads, shells, or whatever comes to mind through the center. It’s a versatile shape and am very much looking forward to making it in different sizes and colors. Our speaker today was Anne Lullie http://annelullie.com/index.html and what wonderfully colorful quilts she makes. I was intrigued by her most recent mosaic work. It was spectacular. They managed to brighten up our dreary Upstate New York weather so much that the sun came out as we left the meeting. Mere coincidence? I choose to think not. She had patterns and some of her wonderful hand dyed fabric for sale, but I resisted because I had already spent a bundle on some of the wonderful textiles Priscilla Kibbee brought home from her recent travels in Vietnam and Guatemala. Buttons, beads, silks, hand embroideries – it was a fiber lover’s feast at the meeting today. A sewing machine class on Monday, followed by a day of running errands on Tuesday left little time for working on the TIFC. The format has been changed so many times, I was beginning to wonder if I’d ever get to using the fabric selected. The cool colors for this challenge are not my favorite, but I felt it was important to use them. Why? Because there is a whole world of color available to us, and I consistently ignore the cool colors in my work. This would be good practice and who knows? I might be induced to use more cool colors in my future fiber art. It became evident as I was searching through my fabric collection that warm based colors are my favorites. The blue section is miniscule and the violets are pretty much well non-existent. It’ll be tough on my credit card, but I do believe a fabric shopping trip is in my near future. Today was spent sewing and making 2 different arrangements. They are way too calm for my taste. Some complimentary color would zip them up, but what were the compliments to these colors? Never fear, the internet is here. I found another great website – www.colorsontheweb.com It has multiple color tools, but I used The Color Wizard. All you do is type in the HEX code number for the color you are using and click set. You can select complimentary or split-complimentary and the new colors and numbers will be displayed. What a great resource! I hope this new website will help some of you with the TIFC and in your other art projects. Last evening was spent doing some research on how to make a crazy quilt square, as the TIFC colors will be used for this project. 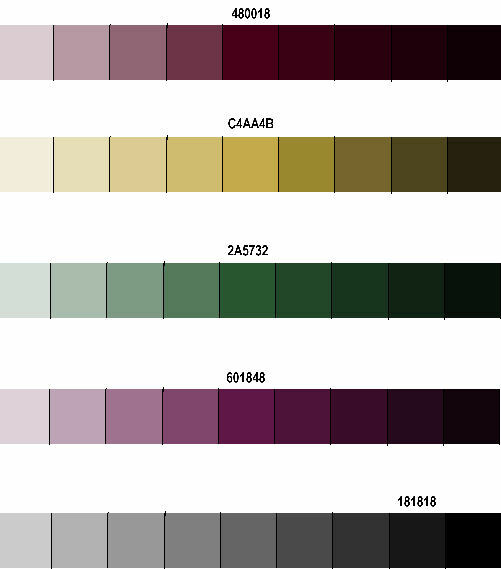 Speaking of colors, I found a wonderful website that enables us to create color gradations. All you need is the Hex, RGB or RGB% number and it will blend from any color to any other color. I used it to blend each color in the challenge, shifting the value from black to white. This morning, I made a color blend chart of the challenge colors in Paintshop Pro – a Corel product www.corel.com Paintshop Pro is a software program I use to edit photos and digital art. It would be easy for anyone to do in other similar software. Here’s how I did it. I opened a new image 8″ x 2″. I used the pen tool to draw a line of boxes. The number is up to you. Mine were 3/4″ square. Then I cropped the line of boxes, saved it as a new image. Next, it was copied, and I opened a new image that was 8″ x 10″. I pasted that line of boxes 5x, as a new layer, one at a time into the big 8″ x 10″ image. This let me easily move it in place. Then it was saved. 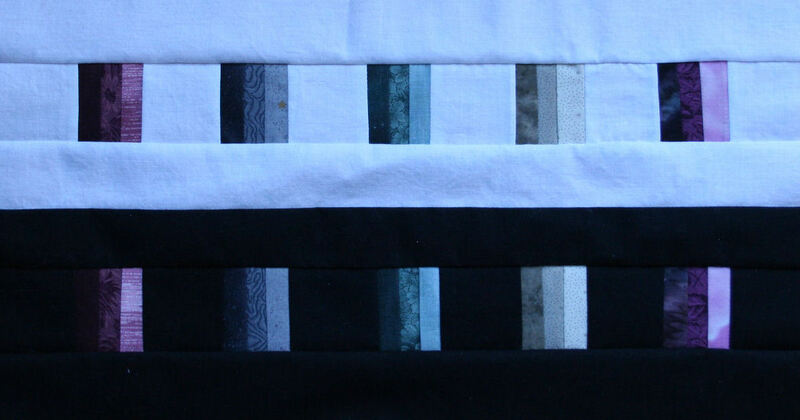 Most of the challenge colors were placed in the middle, but the dark grey was already so saturated, that I added plain black to the end of the row and filled in with all lighter blends. A picture of the chart I made for myself is at the end of this post. Feel free to copy it and save it to your computer if you’d like to use it also. The plan is to select fabrics from the chart and then embroidery threads, beads, ribbons, laces, etc.. that blend well and some that complement the fabric. That bit of contrast adds a lot of pizzazz to a piece, and life is so much more fun will a little pizzazz in it.